A dental implant is a dental restoration that has changed the way people with missing teeth think about their oral health. Unlike removable dentures or fixed bridges, dental implants are placed via oral surgery and help you get a new and fully-functional smile. At the dental office of Steve R. Carlson, DDS we provide dental implant treatment planning and implant restoration in Gladstone, MO. With dental implants, our patients enjoy smiles that are strong, healthy, and beautiful. Removable dentures (both full and partial) or fixed bridges are standard choices for replacing missing teeth, but they often aren’t as strong as dental implants. Partial dentures are anchored in place by a retainer and full dentures use adhesive – both of which can slip or loosen throughout the day. And bridges, while sturdy, use dental crowns, which mean healthy teeth need to be altered to replace a missing tooth. 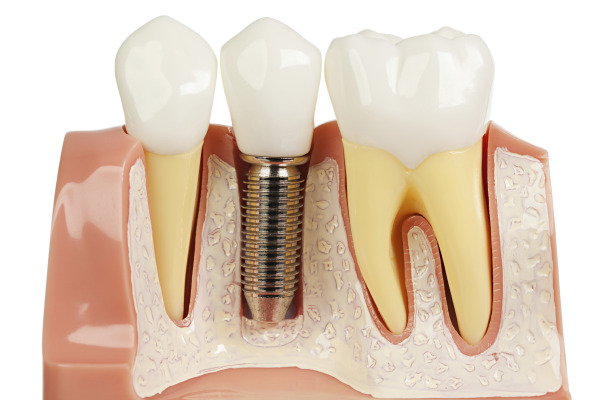 • Dental implants are independent and strong. Getting an implant does not involve altering healthy teeth. • Implants consist of a titanium post, which is placed at the site of a missing tooth and naturally become a part of your oral structure. • By bonding with bone in your jaw, the implant is able to keep bone healthy, like a real tooth root would, helping maintain the natural shape of your face and prevent bone loss. • Implants are low-maintenance. There are no adhesives or rinses needed to apply and care for your new teeth. You can treat them the same as you would a real tooth. Dr. Carlson works closely with a trusted local oral surgeon for placement of your dental implant(s). We begin the treatment process by welcoming you into our office to design your treatment plan. Dr. Carlson goes over your dental history and performs an initial evaluation to give our oral surgeon the information he needs to place your implant at the right angle for maximum stability. Implant surgery is a simpler process than most patients imagine. Patients receiving single implants can return to work the same day. Once your implant has been placed and has properly healed, you’ll return to our Gladstone dental office where Dr. Carlson will take impressions for the creation of your crown – the final restoration to finish your treatment. The end result is a fully restored smile that helps you achieve renewed oral function. For patients with missing teeth who are not good candidates for oral surgery, we’re happy to provide fixed dental bridges – a popular alternate restorative dental method that helps renew your smile. Ready for Your Dental Implant? Contact Our Office to Get Started! We love to help patients get brand new smiles with dental implants in Gladstone. If you have questions about implant dentistry, or your options for replacing teeth, contact Dr. Steve Carlson and his team today to learn more.